Synopsis: From producer Jerry Bruckheimer (Pearl Harbor) and director Gore Verbinski (Mouse Hunt) comes the thrilling, high-seas adventure PIRATES OF THE CARIBBEAN: THE CURSE OF THE BLACK PEARL. The roguish yet charming Captain Jack Sparrow's (Johnny Depp) idyllic pirate life capsizes after his nemesis, the wily Captain Barbossa (Geoffrey Rush) steals his ship, the Black Pearl, and later attacks the town of Port Royal, kidnapping the governor's beautiful daughter Elizabeth (Keira Knightley). In a gallant attempt to rescue her and recapture the Black Pearl, Elizabeth's childhood friend Will Turner (Orlando Bloom) joins forces with Jack. 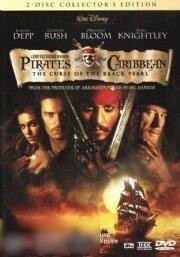 What Will doesn't know is that a cursed treasure has doomed Barbossa and his crew to live forever as the undead. Suspense filled adventure, sword clashing action, mystery, humour, unforgettable characters and never before seen special effects make "Pirates" a must-have movie on the grandest scale ever. We have a disc cleaning machine and all disc's are cleaned (if needed) and polished to be the best quality than we can achieve with the disc's before posting out the items, most disc's clean up to being very close to as new condition.